Hello, this is Rich again from Western Appliance in Boise and Meridian Idaho. This picture is from a customer here in the treasure valley. 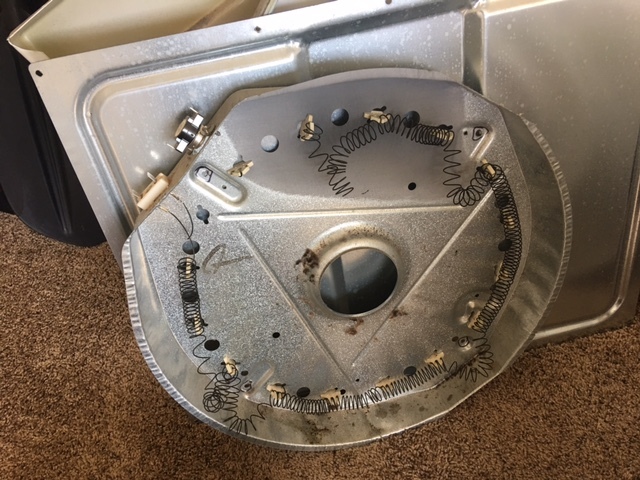 This is what a heater element looks like in a Frigidaire dryer stack unit. When I say stacked I mean a dryer that is stacked on top of the washer. In this instance the dryer is actually part of the unit, but I still call it a stack. Anyway, this heater element has seen better days. It’s very burned towards the very top of the pan which suggests there may be an air restriction in the system. When air is restricted the heater element will burn hotter and in this type of heater, the heat usually burns hotter towards the top. As you can see, the coils near the top of the “pan” are broken. I was unsure of it was broken because of excessive heat but I found out later that the customer had tried to take this apart with the power ON. Yes, there were sparks and flames I was toldJ. So, this may have been the cause of the breaks however, the original problem was a dryer without heat. Well, in a nutshell, the dryer heater element was bad and we had this repaired in no time. This stack unit cost about 1300.00 new so a two hundred dollar repair was well worth the money.